In the 1980s the term "constructability" evolved in the USA. The proponents of this concept believe that constructability, which embraces both design and management functions, is comprehensive in facilitating construction operations and solving problems on site. Constructability problems are common on the construction site, due to the lack of construction experience in the design team and the absence of tools to assist designers in addressing constructability. Moreover, designs are predominantly done early in the project in the absence of contractor input, and there is yet no explicit means of defining or measuring constructability. This paper aims to address constructability problems in building construction, by understanding the nature of constructability knowledge and investigating how construction experience may be effectively disseminated amongst project participants, particularly through the use of lessons learnt programmes and inter-disciplinary knowledge sharing. It has been found that there is fundamental misalignment between consultants and contractors on the perceptions of criteria for a constructible design, implications of design decisions, and certain traits that may represent optimised vs poor constructability. The discrepancy in communication is the elemental cause of constructability problems and this research has demonstrated how lessons learnt programmes can be an effective tool in attaining better constructability knowledge management and collaboration. Constructability is a very common subject in the construction environment, often with controversial implications on the successful delivery of the project. Yet, little research has been dedicated to address such issues explicitly. Constructability issues arise from a design which does not sufficiently embody the expertise of construction processes, rendering the design "difficult to construct" on site. Subsequently this creates a variety of negative secondary effects during project execution, eventually manifesting as time-, budget- and quality risks to the project. 1. Investigating explicit means to define constructability. 2. Investigating knowledge management activities, particularly through lessons learnt programmes, currently experienced in the industry. Perceptions regarding constructability, similar to the implications of design and construction decisions, are mostly rooted in the experience of the industry professionals, and form the basis for this research. The primary methodology employed is thus a combination of questionnaire surveys and personal correspondences, in order to extract relevant knowledge from experienced professionals in the South African industry. In this study, several traits have been identified as implications of optimised vs poor constructability, which are tested through the analyses of responses from South African industry practitioners. The lessons learnt programme (LLP) - its nature and implementation in organisations - is investigated in detail, and recommendations are given as to how LLPs can be a pertinent approach to improve the management of constructability knowledge, hence improving issues of constructability at large. The scope of the research is limited to the building industry, as most civil engineering organisations would have had substantial experience in building projects, where constructability issues are prevalent. Some background on constructability and knowledge management related concepts are first presented, followed by the results and discussions of the investigations in two main parts. Constructability is defined as "the extent to which the design of a building facilitates ease of construction" (CIRIA 1983), or more descriptively, "the optimum use of construction knowledge and experience in planning, design, procurement, and field operations to achieve overall project objectives" (CII 1986). The prevalent procurement methods of building construction projects, such as design-bid-build, hinder the application of constructability concepts in design. This is problematic mainly during early project phases, in which constructability application is particularly desirable (Pocock et al 2006; Song et al 2009). Traditionally, therefore, either first steps of design and planning take place without any constructability input (Fisher & Tatum 1997), or, at best, the flexibility of changing the design by further constructability input from the contractor is limited after major decisions have already been taken (Soibelman et al 2003). Several studies have dealt throughout the years with the issue of designers being unfamiliar with construction knowledge. Fisher and Tatum (1997) claimed that designers often did not consider the impact of construction constraints, and that the fragmentation of design and construction hindered effective information exchange. 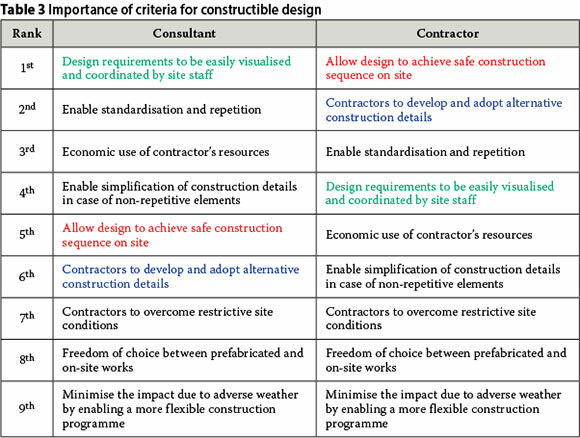 Song et al (2009) stated that failure of design professionals to consider how a contractor will implement the design can result in scheduling problems, delays, and disputes during the construction process. It is evident that there is a lack of practical knowledge on the part of designers, and the fragmentation of the design and construction environment discourages implementation of constructability knowledge during design. Another great barrier is that there is no comprehensive explicit definition for constructability knowledge, which emphasises its tacit nature - being accumulated mainly in the minds and experiences of relevant professionals. This research looks at the extent to which constructability can be explicitly defined and thus measured, quantified, and subsequently codified. Along with this an approach of knowledge management, in particular the lessons learnt programmes, is explored to allow integration of constructability knowledge during design. The implementation of constructability codes or guidelines poses a pertinent initiative in improving constructability as aid to the designer in the early stages. The challenge here lies in the explicability of constructability expertise - in other words, is it possible to explicitly represent constructability knowledge in a codified format, and to what extent? In Asia, the Singapore government has put legislation in place as of 2001 to require minimum buildability scores of designs before approvals of building plans. The Buildable Design Scores are calculated based on the Buildable Design Appraisal System (BDAS), which was devised to measure buildability performance of designs in Singapore. The "3S" principles of Standardisation, Simplicity and Single Integrated Elements form the cornerstones of the BDAS. Good buildable designs will have to be complemented by the adoption of labour-efficient technologies and methods to improve productivity at the construction stage (BCA 2011). The Buildability Design Scores are thus determined primarily on this basis. In Singapore, the Buildable Design Score of any design must comply with the minimum allowable, before the project may commence. "The process associated with the creation of new knowledge, the sharing and transfer of new and existing knowledge, the capture, storage, exploitation and measurement of the impact of knowledge, in such a way that it benefits the unit of adoption, which can be consulting or contracting organisations." The concept of constructability and related problems highlights the tacit nature of constructability knowledge. Constructability knowledge largely forms part of the experiences and expertise embedded within the minds of personnel in construction, and is difficult to standardise due to the diverse perceptions in the industry. Therefore, the sound management of knowledge resources is key to improving constructability overall. The sound management of knowledge within an organisation enables effective identification and dissemination of constructability problems and the subsequent efforts to mitigate or avoid them in future, by back-channelling constructability knowledge and expertise into the design and planning stages. This can be achieved through cross-organisational and cross-disciplinary knowledge exchange, particularly between consultants and contractors. Work by Polanyi (1958), and Nonaka and Takeuchi (1995) divided knowledge into tacit and explicit. Tacit knowledge represents knowledge based on the experience of individuals, expressed in human actions in the form of evaluation, attitudes, points of view, commitments and motivation (Nonaka et al 2000). Since tacit knowledge is linked to the individual, it is very difficult, if at all possible, to articulate. Researchers have argued that the diffusion of tacit knowledge is more difficult than sharing explicit knowledge (e.g. Nonaka & Konno 1998; Leonard & Sensiper 1998). Explicit knowledge, in contrast, is codified knowledge inherent in non-human storehouses, including organisational manuals, documents and databases. Yet, it is difficult to find two entirely separated dichotomies of tacit and explicit knowledge; instead knowledge can fall within the spectrum of tacit knowledge to explicit knowledge. The management and sharing of tacit knowledge pose pertinent relevance to constructability, given its tacit nature. However, there is in existence also explicit, codified forms of constructability knowledge, such as Singapore's Buildable Design Appraisal System. This research probes the extent to which tacit constructability knowledge can be explicated and used as codified knowledge by designers. Foy (1999) defines the concept of knowledge sharing as "facilitating learning, through sharing, into usable ideas, products and processes". This naturally applies for both tacit and explicit forms of knowledge mentioned previously. A lessons learnt programme (LLP) consists of the people, processes and tools that support the (1) identification, (2) analysis and (3) implementation of new knowledge. This implies both the creation and sharing of validated lessons learnt. Foy's (1999) definition of knowledge sharing implies that "learning" is an artefact from the knowledge sharing process. An LLP therefore can be regarded as a vital tool in attaining effective knowledge management in the industry - especially of constructability knowledge. Harrison (2003) defines lessons learnt as "a good work practice or innovative approach that is captured and shared to promote repeat application, or an adverse work practice or experience that is captured and shared to avoid recurrence". Organisations in the construction industry cannot afford to make repetitive mistakes on major projects. Conversely, there are great benefits to repeating positive experiences from past projects. An effective lessons learnt programme is a critical element in the management of constructability knowledge, in both explicit and tacit forms. The lessons learnt programme is investigated in detail in this study, along with the implementation of the project close-out meeting, which is a highly pertinent method for lessons learnt activities and cross-disciplinary knowledge sharing to be carried out. For these investigations, the questionnaire survey was primarily used to extract tacit knowledge pertaining to constructability from experienced practitioners in the South African industry. Questionnaire surveys were distributed to a total of 50 industry respondents, and 28 completed responses were received - a response rate of 56%. Respondents of this study consist of both consultants and contractors - approximately the same number of respondent for each, so as to allow sensible comparison of the results. The 11 consultants and 17 contractors have varying years of experience, job positions and technical disciplines, as shown in Table 1. It has not been the intention to focus particularly on a large-scale statistical or quantitative analysis of survey results. Rather, it was of greater significance to reach insightful practitioners to provide relevant and meaningful responses, hence the seemingly small number of respondents. Both consulting and contracting respondents have leading roles at their organisations, substantial amounts of professional experience, and a high level of familiarity with civil and building projects. Also, only contractors with a CIDB (Construction Industry Development Board) grading of 9CE and 9GB were chosen. Due to the small number of the respondent group, regardless of respondents' expertise, it is nevertheless worthy to note that the results from the surveys may or may not be representative of the industry at large, especially considering the fragmented nature of the construction industry. Furthermore, the quantitative analysis is done on qualitative data based on perceptions. The results were thus interpreted with a reasonable degree of scepticism and tolerance. The research takes care to consider all the limitations implicit in the research principles and questionnaire processes. However, the professional opinions of the practitioners offer valuable insight and experience, the credibility of which should not be ignored. The questionnaire investigations were undertaken in two parts. ■ Constructability implications of design decisions. ■ Perceived potential of LLPs. The scoring system used in Singapore's Buildable Design Appraisal System (BDAS) is based primarily on the labour efficiency principle. This aspect is tested in the South African context - whether or not designs and construction specifications promoting labour efficiency can be equated to good constructability. In South Africa it can be said that the sizable industry opinion prefers the use of in situ concrete. Some reasons may be that it generates human labour and thus arguably increases employment, regardless of the efficiency of the labour; or that in situ concrete design typically has higher safety factors; or that in situ concrete construction processes do not require as much prudent coordination and planning as that of precast methods. Due to common usage of in situ concrete over the years, precast methods hold uncertainty that may be interpreted as potential project risks. South African industry personnel are speculatively more comfortable employing in situ concrete methods. This industry trend seems contradictory to the labour efficiency principle of the Singaporean codes, where equipment-intensive work and precast concrete would be preferred, as they are of higher labour productivity (labour to output ratio). In the survey, respondents were asked to indicate the preferred choice between equipment-intensive and labour-intensive construction, and between precast and in situ concrete. The results are shown in Table 2, as percentage of respondents for each choice. The results show that both consultants and contractors prefer equipment-intensive over labour-intensive work. Consultants prefer in situ concrete, which in theory does not concur with the preference of equipment-intensive work concurrently indicated. On the other hand, contractors prefer precast concrete. A fundamental misalignment can be exhibited here regarding the preference of principle methods or approaches, implying different perceptions between consultants and contractors towards the inferred constructability of these approaches. This further emphasises the need for constructability issues to be studied to understand the nature of such misalignments. The reasons behind the differences in perceptions of the different parties are not explored in this paper. Nevertheless, sensible deductions can be made from these results. 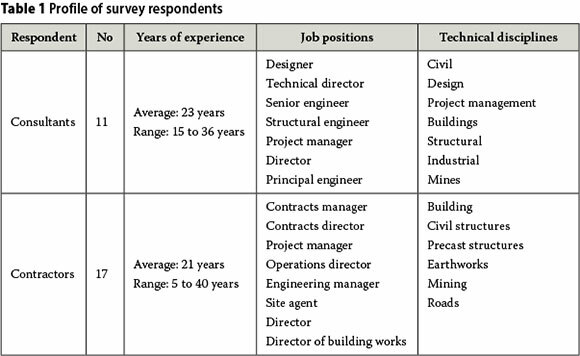 Lam and Wong (2011) reviewed the Buildability Assessment Model (BAM), proposed for measuring buildability of designs and establishing benchmarks for the construction industry in Hong Kong. The BAM identifies nine "buildability factors" (as seen in Table 3), and appraisal is based on how well the designs embrace these nine factors as expressed by a large pool of experienced practitioners having hands-on construction expertise. The perceived importance of these "buildability factors" as "criteria for constructible design" within South Africa was investigated, and a comparison was drawn up between contractors and consultants. Survey respondents were asked to qualify the importance of these criteria and the results were analysed and ranked as shown in Table 3. Rankings of the consultant and contractor are placed alongside for comparison. There are some similarities and differences in opinion between consultants and contractors regarding the criteria of constructible design. Good correlation can be seen in the three least important criteria ranked. Both consultant and contractor also agree on the importance of "standardisation and repetition". However, contractors regard "allowance for adopting alternative construction details" (shown in blue in Table 3) and "safety of construction sequences" (shown in red in the Table 3) as important constructability criteria, while consultants rank these considerably lower. The consultants ranked "ease of visualisations of design requirements" (shown in green in Table 3) as the highest, while it is only ranked fourth by contractors. There is thus some misalignment between consultant and contractor regarding the importance of criteria of a constructible design. Design decisions are predominantly made by the consultant in the absence of the contractor. Choices pertaining to the type of components to use in a building design, as well as the configurations of each component, have constructability implications during the execution of the project. This investigation essentially identifies the effect of different design choices on constructability. In the Singaporean code, following the labour-efficiency principles, labour-saving indices are determined and calibrated with extensive industry input. These labour-saving indices essentially determine a constructability score, and is the crux of constructability quantification. Labour-saving indices are different for different variations of building components and subcomponents employed in the design. 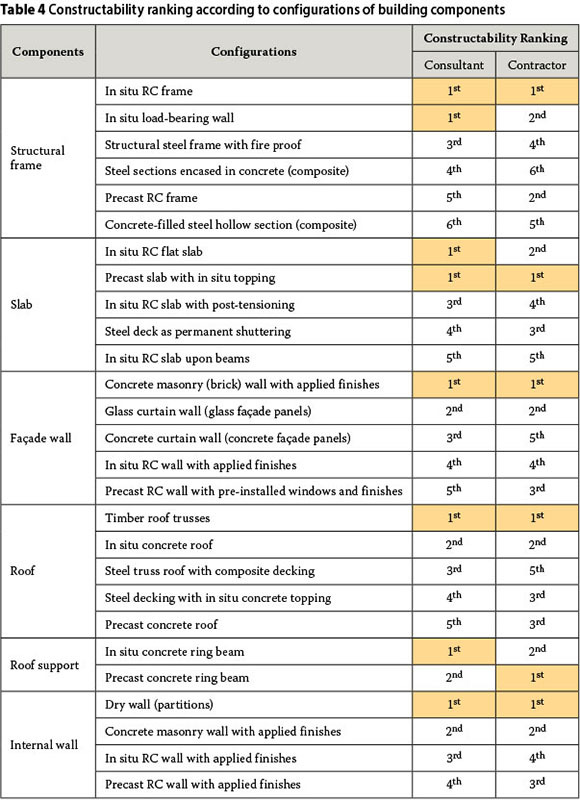 Based on a similar methodology of quantification, this study has identified some major building components and different configurations by which these components can be designed or constructed (components and configurations as shown in Table 4). The respondents were then asked to qualify each configuration in terms of "ease of construction". This would ultimately indicate the preference of one configuration over another, which can in turn be equated to a constructability ranking. These perceptions (of consultants and contractors) regarding the favourability of different variations/ configurations of the above building components can be used to attain a more explicit definition of constructability. Instead of looking at the absolute constructability ratings, it is more relevant to regard the relative ranking of these configurations, as it essentially indicates the tendency for one configuration to be chosen over another from both consultant and contractor perspectives. Table 4 shows the overall ranking of constructability ratings for each configuration as indicated by the respondents. The top-ranked configuration for each building component is highlighted in each case. Note: Where constructability ratings are the same for two configurations, the standard competition ranking (so-called "1-2-2-4" ranking) is complied with. This implies that the tied items are assigned the equal ranks, directly below the preceding rank, and leaving a gap one less than the number of items tied (e.g. 1-1-3-4 or 1-2-2-4). Regarding the top-ranked configurations of every component, good correlation can be seen between the consultant and contractor - all components correspond, except for the Roof Support. According to consultants and contractors, composite configurations (e.g. concrete-filled steel sections or steel encased in concrete), wherever applicable, are of low constructability. The in situ RC slab on beams is agreeably ranked last by both. There are also some disparities between consultants and contractors. Consultants made it clear from the start that in situ concrete is preferred, which is reflected in the results here - consultants consistently rank precast configurations considerably lower. Contractors, on the other hand, rank the precast configurations higher than the consultants on all cases, indicating that contractors are more susceptible to using precast than what the consultants would perceive. Despite contractors' earlier indication that precast concrete is preferred over in situ concrete, some contradictions can be identified. For Structural Frame and Roof components, contractors ranked precast configurations lower than in situ configurations. Furthermore, despite the fact that both contractors and consultants indicated the preference of equipment-intensive over labour-intensive work, masonry wall configurations (which are more labour intensive) for the Façade Wall and Internal Wall components are ranked higher than both precast and in situ RC wall configurations. This apparent contradiction may indicate that there are other factors or reasons, besides the preferences of equipment or labour-intensive work, for favouring masonry configurations, or rejecting other configurations for that matter. These other factors may include direct costs (masonry being cheaper first-hand), uncertainty risks associated with seldom-used precast configurations, and availability of precast plants, but may also be a simple industrial habit, which is not clearly justifiable. The sound management of constructability knowledge, from different phases of the project, can be seen as the fundamental solution to improving constructability in the industry. For one, the management of knowledge regarding different preferences (say from the Part I survey), and sharing this knowledge with relevant project parties, would invariably lead to better understanding and thus more informed decisions to avoid constructability problems. ■ Perceived effectiveness of lessons learnt programmes. The respondents were asked to choose whether the lessons learnt activities at their organisations are: formal (standardised protocol built into organisational process, with designated coordinator); informal (occurs haphazardly, no standard process, no designated process coordinator); or does not exist at all. 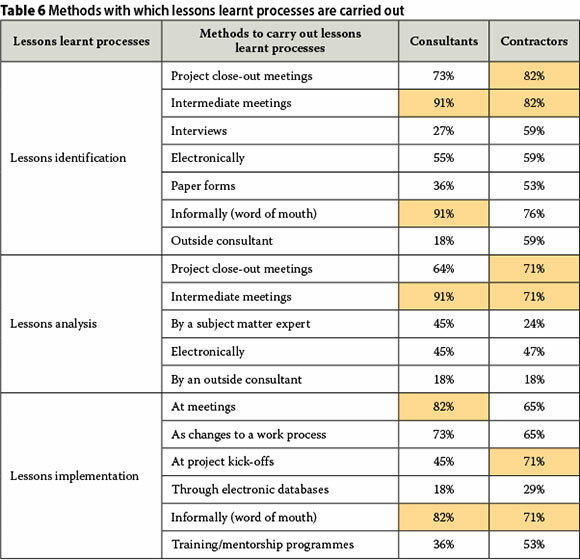 Table 5 shows the results, indicating that most organisations undertake lessons learnt activities on an informal, unstructured basis. Three lessons learnt processes were identified in literature: lessons identification, analysis and implementation. The respondents were given the list of methods/occasions where lessons learnt can be carried out and asked to indicate which ones they use. The percentages of respondents for each method are presented in Table 6 (in no particular order). The highest ranked method/s is/are highlighted for each lessons learnt process. The top methods that are shown here exhibit a people-orientated nature, where socialisation and human interaction are prevalent. The social nature seems appropriate for sharing constructability knowledge, considering its highly tacit characteristic. However, the social nature may also be associated with the lack of structure in such lessons learnt activities. As expected, and as shown in the previous section, the project close-out meeting is a very important and widely used method for carrying out lessons learnt processes - in particular, for the identification and analysis of lessons. For this reason specific attention is given to investigate the nature of project close-out meetings as implemented in the industry. The essential question posed here is: Are such close-out meetings indeed carried out in design and/or construction firms, and if so, who (by discipline or position) are the typical attendees? Knowing who the attendees are is of key importance, as it roughly indicates the different sources of knowledge flow present at the meeting and thus the adeptness of close-out meetings to disseminate con-structability knowledge/lessons. The project close-out meeting is an important occasion where discussions and analyses of issues from the project can occur, and from numerous perspectives - especially between design and construction. In principle, it would be ideal to have personnel from all project phases present at the close-out meeting to share their positive and negative experiences on the project. ■ Contractors carry out project close-out meetings much more than consultants do, and with a wider variety of attendees. ■ Consultants' attendance/presence at contractors' project close-out meetings is very feeble - only 4 of 17 contractors indicated the presence of the consultant at the project close-out meetings. Therefore many issues (especially that of constructability) cannot be addressed with collaborative engagement from both consultant and contractor. ■ Most common attendees of project close-out meetings are: contract managers, project managers, site managers, directors, estimators and quantity surveyors. ■ The dynamic exchange of knowledge and inter-disciplinary discussions of constructability issues are not substantial at project close-out meetings. This investigation reveals that there is very limited consultant presence at contractors' project meetings. This implies that constructability problems experienced on site that may have been attributed to a poor design, cannot be discussed in full with engagement from design personnel. Even if the project close-out meetings are implemented prevalently, and lessons learnt activities are carried out, it may still not achieve the required benefits. Active engagement from both the consultant and the contractor simultaneously is the key to a relevant knowledge exchange practice. The respondents were asked to choose the effectiveness of lessons learnt programmes (LLPs) currently implemented at their organisations, as well as their perceptions of the full potential. Table 7 shows the percentage of respondents (consultants and contractors combined) and the choices made. Most respondents perceive current implemented LLPs to be "somewhat effective", while the full achievable potential can be "very effective". The results show that respondents perceive higher potential effectiveness than how it is currently implemented. There is thus premise for improvement in LLPs and implies a degree of industry susceptibility for such endeavours. ■ Understood how lessons learnt programmes are implemented in the industry context, and the types of methods where lessons learnt activities are facilitated. ■ Constructability knowledge exists predominantly in tacit format, forms complex networks of cause and effect, and related issues occur under unique circumstances. ■ There is some misalignment between consultants and contractors regarding certain design and/or construction decisions and their implications on the project. Thus, the definition of optimised vs poor constructability is understood differently by consultants and contractors. This demonstrates a real need for more collaboration between the two disciplines. ■ Consultants prefer the use of in situ concrete, while most contractors prefer precast concrete. Concurrently, both agree on the preference of equipment-intensive methods, rather than labour-intensive. ■ precast concrete ring beams as roof support. ■ Lessons learnt programmes (LLPs) are carried out mostly informally on an unstructured basis, where the methods used are of a social, people-orientated nature. Respondents see higher potential effectiveness than what is currently experienced, indicating premise for improvement. ■ There is generally a lack of integration between construction and design, due to a poor collaborative mentality. The management of cross-disciplinary knowledge/ lessons (particularly that of constructability) is insufficient. As can be deducted, "constructability" in itself is not the problem per se, but it is the consequence of a complex relationship of preceding problems, both technical and social in nature. These are often rooted in the organisational culture and philosophies of the company, such as issues regarding collaboration, communication, or willingness to implement structured knowledge management, etc. Nevertheless, "constructability problems" manifest prevalently and cause not only tangible waste in time, budget and quality, but also an inherent over-exposure to a diverse range of project risks. To motivate improvement measures through financial and economic analyses is impossible, due to the complex nature of this network of interactive problems, most of which are hardly quantifiable and lie within fields of psychology and social sciences. Attempts to monetarily justify certain decisions over others would be erroneous to improving constructability, since the attempts to quantify with respect to cost would be subjective to start off with, and misrepresentative of the problem at hand. Furthermore, due to the uniqueness of the reasons behind certain design or construction decisions, it is also very difficult (and probably not meaningful) to infer principles dictating which types of design/construction configurations or methods are definitely more constructible than another. Nevertheless, a fundamental certainty arises from this research - there is distinct misalignment between the perceptions and assumptions of different project participants (particularly consultant and contractor), due to poor communication or collaboration, and a lack of sound knowledge management practices. ■ Explicate constructability concepts further to develop codes and guidelines to aid designers. ■ Promote the consideration of precast methods as alternative to in situ, in order to understand and optimise the potential benefits of precast. ■ Establish an organisational culture, which promotes structured, cross-disciplinary knowledge sharing and a more collaborative mentality to project delivery. ■ Adopt and formalise lessons learnt programmes, integrated systematically into operational procedures. ■ Consultants should carry out designs with more consideration of safety on site, as well as increased flexibility for alternative construction details later in the project. ■ Increase research on projects in different procurement environments (such as design-build projects) to investigate whether more collaboration indeed occurs, or whether less constructability issues arise. A procurement model where design and construction considerations are integrated could potentially result in more optimal outcomes. VINCENT KUO received a BEng, and subsequently an MScEng from Stellenbosch University, where he assumed research relating to design-construction integration. He has worked in Aurecon's Environmental and Advisory Unit within the discipline of Asset Management, and Is currently pursuing doctoral research at Aalto University In Finland, with focus on Building Information Modelling. Vincent is a young member of the South African Institution of Civil Engineering, and currently serves on the Institution's Young Members Panel. PROF JAN WIUM PrEng (MSAICE) is professor In the Murray & Roberts Chair of Construction Engineering and Management In the Department of Civil Engineering at Stellenbosch University He obtained a BSc(Eng) and MSc(Eng) from the University of Pretoria, and a PhD from the Swiss Federal Institute of Technology In Lausanne. He worked as a consultant for 20 years before joining Stellenbosch University in 2003. After first researching the behaviour of concrete structures and seismic analysis of structures, he now focuses his research on the management and initiation of multidisciplinary projects.